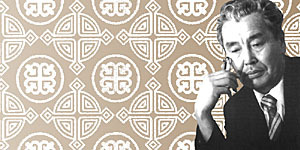 Alexander Badmaevich Soktoev, corresponding member of RAS (1931-1998) is the leading expert in the field of literary criticism and folklore, the leader of Siberian folkloristic school, the founder and the organizer of a fundamental academic scientific publications of a 60-volume bilingual series «Folklore monuments of peoples from Siberia and the Far East», the first director of the Institute of philology that is the unique in the system of Russian Academy of Sciences. A.B.Soktoev graduated from the East Faculty of Leningrad state university in 1953, and then postgraduate study of V.I.Lenin Moscow State Pedagogical institute in 1956. In October 1956, Alexander Badmaevich comes to Ulan-Ude and starts working in D.Banzarov Buryat State Pedagogical institute first as assistant, and then senior teacher. He reads a course of lectures on the foreign literature. In the course of time, he gets the rank of senior lecturer. During many years (1959-1965) he heads a sub-faculty of Russian and foreign literature. In 1966, Alexander Badmaevich switches to work at the position of senior research associate in the department of literary criticism and folklore studies of the Institute of social studies of the Buryat Branch of the Siberian Branch of AS USSR. In 1970-1974, he is the scientific secretary of Presidium of the Buryat Branch of SB AS USSR. During eight years (1975-1983), he works as the deputy director of the Buryat institute of social studies. In 1983, A.B.Soktoev moved to Novosibirsk and became the organizer of folklore sector of peoples of Siberia and the first director of Institute of philology the United institute of history, philology, and philosophy of the Siberian Branch (1991-1998). He founded a series «Folklore monuments of peoples from Siberia and the Far East», and executed the duties of the assistant for editor-in-chief of this series of books. The main purpose of the series constitutes a scientific edition of outstanding folklore works of art of peoples from Siberia and the Far East. 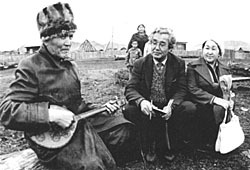 The concept to publish folklore classics of Asian Russia that was designed by A.B.Soktoev included a series of innovation positions: to clear a barrier between philological, musicological, and ethnohistorical approaches in research and textual part of the series, their combination and mutual benefit; to conserve the language, dialect, and musical authenticity of the text publications; to achieve the maximum expressiveness of the scientific translation, adequate to the origin; to supply each volume with a phono appendix that was furnished with voices of storytellers and singers. It has been possible to unite specialists around the project, namely, those in folklore, ethnographers, linguists, ethnomusicologists within the former Soviet Union from Baltic up to Kamchatka: they included scientists from Academic Scientific Council in folklore, 14 scientific research institutes, and 20 institutions of higher education. Number of all participants that worked on the volumes of the series exceeded 150 person. It was conceived that the series «Folklore monuments...» would publish the total of 60 volumes. As of 2010, 29 volumes have been published. The series includes monuments of oral art of many peoples from Siberia and the Far East, the samples of Russian, Belarus, Ukrainian, Jewish, and Tatar folklore, carriers of which live in the identified region. Опубликованы «Evenki heroic legends», «Alamzhi Mergen» Buryat epos, «Russian epic poetry of Siberia and the Far East», samples of Yakut, Tuva, Nanai, Altai, Khakass, Udehe, and Shor folklore have been published. Responses and reviews in Russian and foreign press (Izv. AN. Syer. lit. i yaz. ; American Antropologist; Arctic Anthropology; Canadian-American Slavic Studies; Fabula etc.) confirm that the series has gained the great scientific recognition. It has been classed with «the most significant humanitarian publications in the history of Russia and in Russian modern school of thought», and with «one of the most impressing from all publishing projects of the 20th century». In 2001, the collective of A.Derevyanko, V.Gatsak, N.Alekseev, E.Kuzmina, S.Rozhnova, A.Myreeva, M.Tulohonov, and A.Soktoev (posthumously) was awarded with the State premium of Russian Federation for the development of the concept of the academic series «Folklore monuments of peoples from Siberia and the Far East» and for its realization in 18 volumes that came out to public (Nauka v Sibiri, 2002, N 32/33). A.B.Soktoev is the initiator and the participant of ten frontal complex expeditions to reveal centers of modern folklore occurrences in Siberian-and-Far East region: they have yielded qualitative records for phono appendices and musical sections of 50 volumes. Supervised by A.B.Soktoev, the Institute of philology of SB RAS that performs comprehensive research into linguistics, folklore studies, and literary criticism appeared to be among the leading Russian centres in the field of philological sciences, the collaborators of which are involved in the work to actively effect the great international scientific projects. A.B.Soktoev examined a formative stage and evolution of the Buryat national literature in a wide historical context of intercultural interaction with cultures of other peoples of Siberia and adjacent territories. An in-depth studying the sources of the Buryat literature, in its correlation with the most ancient literatures of the East, namely, Indian, Tibetan, and Mongolian literature, has allowed to change radically an immediate view of it as of a recent written nature that dominated in the Soviet philological science. High scientific professionalism of A.B.Soktoev, its initiative, his outstanding capabilities as the organizer and the coordinator of large-scale research, of publishing programs, and programs in culture preservation are recognized not only in Russia, but also outside the country. A.Soktoev was a member of the International Coordination Council on studying the cultures of related people from Russia and the USA. Memory of A.B.Soktoev is immortalized by dedication record in the volume title of the series «Monuments...» (starting from the 19-th volume); and also by the nominal grant that was founded by the President of the Buryatiya Republic in the field of literary criticism for pupils, students, and post-graduate students; and by regular scientific conferences «Soktoev readings» (since 2006). A cabinet that was named by him was opened in the Buryat State University. * Sources: 1) Pamyati Alyeksandra Badmayevicha Soktoyeva // Nauka v Sibiri. - 1998. - N 27. - C.2. 2) Romodanovskaya YE.K. CHlyen-korryespondyent RAN Alyeksandr Badmayevich Soktoyev (1931-1998) / Romodanovskaya YE.K., Gatsak V.M., Fyedorov A.I. // Izvyestiya Rossiiskoi akadyemii nauk. Syeriya lityeratury i yazyka. - 1999. - T.8, N 1. - C.79-80. 3) Soktoyev Alyeksandr Badmayevich // Rossiiskaya akadyemiya nauk. Sibirskoye otdyelyeniye: Pyersonal'nyi sostav / sost. : G.Vodichyev, G.M.Zaporozhchyenko, O.N.Kalinina, S.A.Krasil'nikov, N.A.Kupyershtokh, D.G.Simonov, S.N.Ushakova, O.N.SHyelyegina; otv. ryed. V.M.Fomin. - Novosibirsk: Nauka, 2007. - S.510-511. Updated: Wed Feb 27 14:46:46 2019. Size: 14,400 bytes.